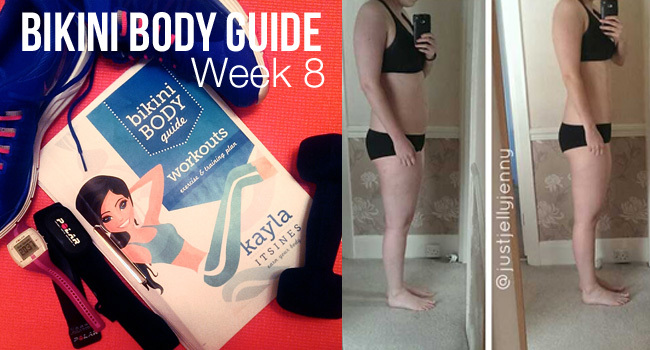 I am now officially two thirds of the way through Kayla's bikini body guide, these past eight weeks have gone by so quickly. I can now do all the exercises, even push ups (okay not many and not too close to the ground, but I can do them) which in my eyes is a big achievement considering I couldn't even do one eight weeks ago. I'm gaining more and more definition each weeks and most importantly I feel happier. Week 8 wasn't my best week, I've started getting very busy at work and over the weekend I felt really ill. So I actually ended up doing less exercise than I normally would. Rest Day - I was still feeling really weak and under the weather, so I rested after work and took an early night. It's better for your body to heal than trying to push it too far and possible make yourself worse. Arms and abs. 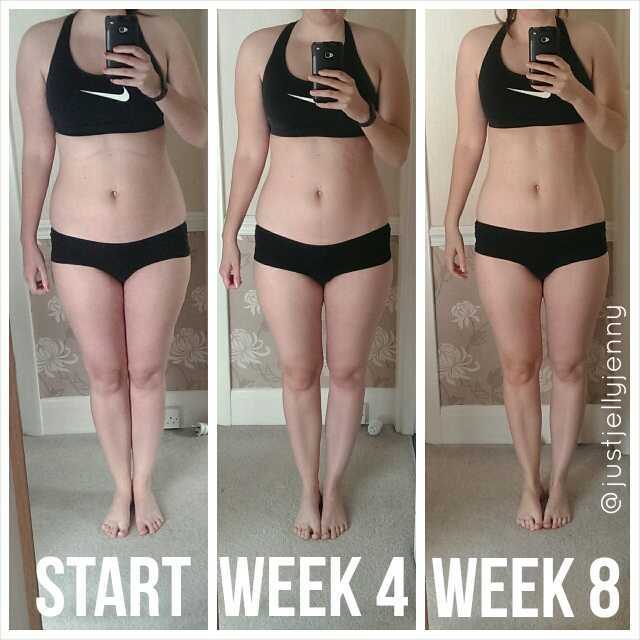 I actually like ab workouts as its the area I want to change the most! This one was challenging and whereas first time I did it I had to break the plank up into 15sec bursts, this time I managed to do it in one go! My core is getting stronger each week. 424 calories burnt. The boyfriend was away this week and it's getting to dark in the evenings to walk on my own, instead of going to the gym I used our cross trainer for my LISS cardio workout. I'm not the hugest fan of a cross trainer, I used to find it would make my hips ache and I wouldn't be able to go for more than 5 minutes! Shocking I know. I pushed through and made myself do at least 35 mins on it, 38 minutes actually! I think I may have been going a bit too fast as my heart rate was high throughout but I burnt 519 calories doing it! Was very impressed! My legs were bright red when I had finished though. Abs and cardio. Another ab workout in the same week! Cardio is something I'll always find challenging! This workout burnt 396 calories! Another LISS workout, a long walk, in the evening, in the dark. Need to get a more powerful torch as I couldn't see a thing! Ended up trying to use my phone light to see. Fail! 350 calories though. Not a workout as such but I had a long shopping trip at a very large shopping centre. That count's as LISS right? Was meant to do my Friday's workout today but I felt really drained by the evening. An unintentional rest day, was feeling poorly so took it easy. Even though I had one of my worst weeks since starting the guide I still made some progress. 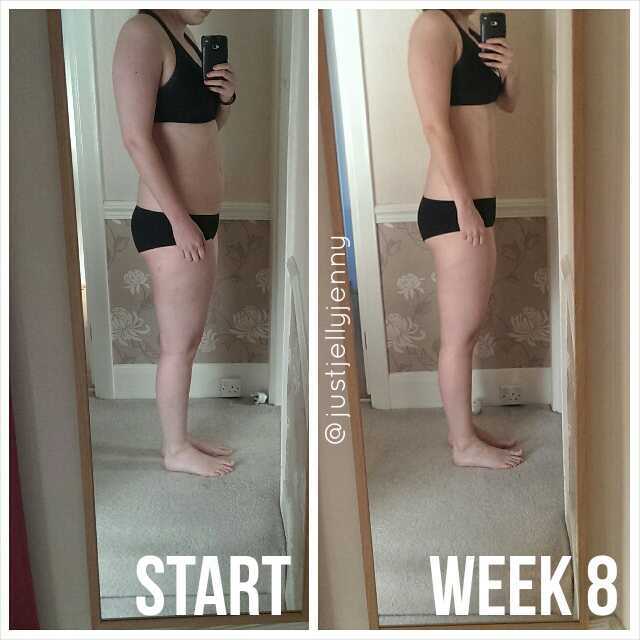 I compared week 7 to week 8 and you can see a difference, especially the side one - my bum apparently wanted to tone up this week! 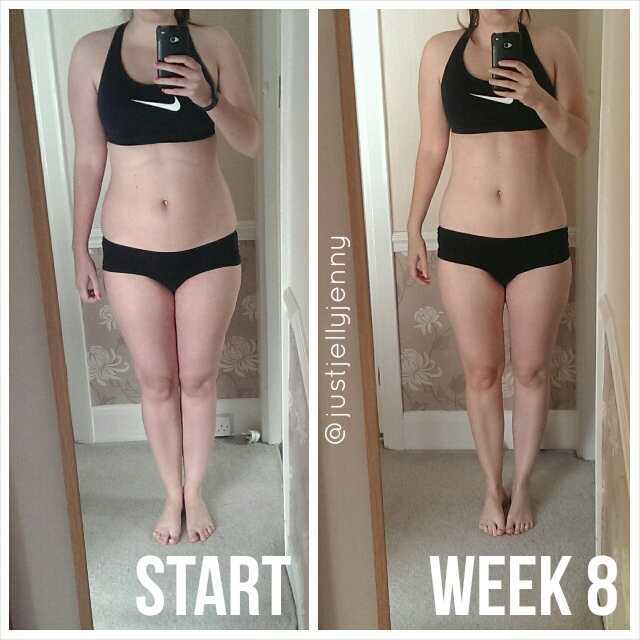 I've added an extra progress shot this week, a side by side comparison of each month to the start - I love how you can see the change. Interestingly I didn't actually lose many inches this month, but it looks like everything just smoothed up a bit.